No RAWA…For Now! Is Sheldon Adelson Finished? 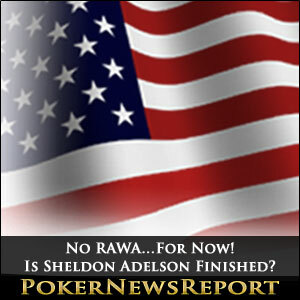 Home » Poker News » Online Poker News » No RAWA…For Now! Is Sheldon Adelson Finished? The poker community may have won the most important coin flip in recent years. They now have the edge over villain Sheldon Adelson. Eight years ago, the online poker world made one of its costliest mistakes of its young existence. What should have been a small lost pot turned out to be a decisive one in the battle for survival. Because of that particular pot, the notoriously Black Friday occurred and over night, almost half of the poker players disappeared in thin air. On the last day before Congress adjourned in 2006, the Republicans quietly attached a gambling-related bill to an unrelated port security measure. That bill became a law, according to industry analyst I. Nelson Rose, a famous one that still has the ability to provoke hysteria in the community every time it is mentioned: the Unlawful Internet Gambling Enforcement Act or UIGEA. Fast forward in 2014, three and a half years after Black Friday, the online gambling opposers tried the very same move in what seemed to be another harmless – yet very crucial – pot. The main villain of the community and the leader of the anti-online gambling movement, Sheldon Adelson used all his persuasion and manipulation skills to steal the pot right in front of the poker player’s eyes, only this time, his opponent reacted immediately. Having learned the lesson from 2006, the community smelled Adelson’s bluff and decided to raise the stakes. It was all or nothing. They already suffered a big blow earlier this year when the Coalition to Stop Internet Gambling convinced the Republicans to introduce a bill – Restore America’s Wire Act or RAWA – that would put an end the online gambling in the US once and for all. The community was shortstacked and figured out what Adelson was trying to do. This time, the Las Vegas Sands chairman played an open-ender very aggressively. He didn’t just settle with his Republicans’ support, he also tried to convince Democrat Harry Reid to join his cause. According to Huffington Post, the business magnate reached out Reid for a ‘big favor’ in the nick of time, just when the Congress had to pass an omnibus spending bill to avoid another government shutdown. This sort of bill includes many measures and just like 2006, a federal ban on online gambling could easily get past the Congress without anyone noticing it. Fortunately, it didn’t. Upon hearing what Adelson was trying to do, the two plus two community reacted and started sending e-mails and calling their state representatives. The feedback from the politicians was encouraging. Poker Players Alliance Vice-President, Rich Muny said that many conservative groups are opposing a vote on RAWA during the lade duck session mainly because it takes away the ability of states to make their own decisions regarding online gambling. The wheel was set in motion as more and more politicians were actively concerned about the government attempts of trampling of Americans’ liberties and shredding of the Constitution. In the eve of the grand all-in battle, on the Poker Advocacy with Rich Muny webcast, former Nevada Representative Jon Porter estimated RAWA’s current lame duck chances at 50/50…a mere toss of a coin or, in poker terms, an Ace-King suited versus pocket deuces…a flip won by the poker community. If we can’t get it into the omnibus, it won’t be in anything. Nevertheless, the heads-up battle for the online market will go on. Neither Adelson nor the poker community will back down. If RAWA doesn’t become law before December 31, 2014, it will need to be reintroduced when the newly elected Congress convenes in January 2015. This delay will give the online gambling supporters some much-needed breathing room and could also give them a slight edge over Adelson. While the corporate-man needs time to lick his wounds, the community will have time to marshal their forces. More and more online supporters could join the party as the state of California recently introduced a new bill to regulate the online poker market. The Internet Poker Consumer Protection Act of 2015 – referred to as AB 9 – is still far from perfect but it’s definitely a step in the right direction. The bill offers licenses only to operators eligible to offer land-based real-money gaming and restricts the companies that offered US players real-money games post UIGEA, companies like Amaya, the owner of PokerStars and Full Tilt. Already, the state of Delaware, New Jersey and Nevada have some forms of regulated online markets and RAWA could have enforced them to ban all the online gambling operators. I will talk to the Congress, and will push for a legislation that will allow our states to decide whether it is something they want to participate in. In the US, all the states have lotteries. I’m not trying to encourage sports betting. I’m just saying there is a lot of sports betting, and if it’s going to happen, it must be done in a regulated environment. The same can be said about poker. And since one things leads to another, the NBA lobbying could have a profound effect not only on the sports betting sector but also on the poker niche and online gambling market as a whole. The edge is on the poker player’s side. Can he take full advantage of it?